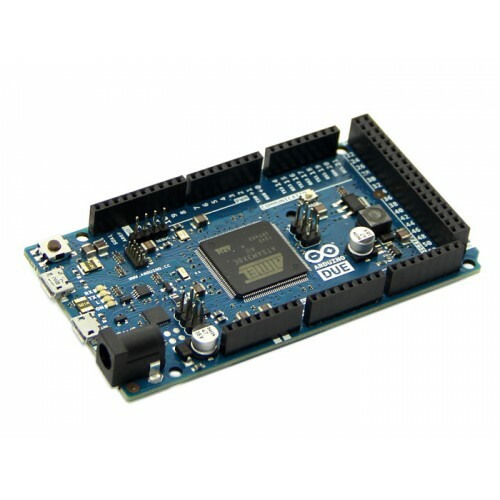 Arduino Due is Arduino's first ARM based development board. This board is based on a powerful 32-bit Cortex M3 ARM microcontroller made programmable through the familiar Arduino IDE. It increases the computing power available to Arduino users keeping the language as compatible as possible so that many programs will be migrated in a matter of minutes! Because of the limitations of system voltage imposed by the Atmel SAM3X8E, Arduino shields that are based on the 5v models won’t work properly. All the shields that fully implement the Arduino R3 layout are compatible straight away (like the Arduino WiFi shield and Ethernet Shield) but other shields might not be compatible.